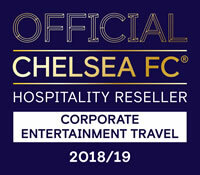 With the success of our premier seats and Champions Club hospitality, we are again delighted to offer you this informal dining package which includes the very best seats at Stamford Bridge for the 18/19 Season. The Champions Club comes with 6 top priced seats with pre-match hospitality at Stamford Bridge to watch Chelsea FC. Our fantastic seats are located in the East Stand Middle Tier in between the 18 yard and half way line. This is a great value for money option for a group of 6 guests. The Champions Club is located in the steeper East Stand and offers some of the best seats in the stadium with a more informal dining experience. The Tambling Suite hospitality package offers you a luxurious way to enjoy the action at Stamford Bridge. Decorated and dedicated to a Chelsea FC legend, you are guaranteed to have an experience to remember. Your match seats will be located within the exclusive West Stand Middle Tier close to the 18 yard line, providing you with magnificent views of the action.